“Will this be on television?” asks Louis Bloom (Jake Gyllenhaal). “Morning news. If it bleeds, it leads,” replies Joe Loder (Bill Paxton), head of a freelance camera crew who just finished filming a fiery crash on an LA highway in the dramatic thriller Nightcrawler. Fascinated and inspired by what he witnessed Loder film, Louis decides to start his own freelance business shooting the news, covering car crashes, fires, murders, home invasions, and other chaos in the city. Hiring a homeless young man named Rick (Riz Ahmed) as his driver and navigator, Bloom sets out across Los Angeles at night with a police scanner and video camera to cover the biggest tragedies for a local television morning news team. News Director Nina Romina (Rene Russo) appreciates his dedication and talented eye for capturing the blood-soaked, grisly realism of L.A. tragedies on camera and Bloom quickly becomes her number one freelancer, covering the biggest and bloodiest news stories for her morning newscasts. As Louis becomes more and more determined to be the best at what he does, the lines between simply covering the horrific stories and helping them become even more sensational blur and eventually disappear due to Bloom’s hunger to get to the story first and obtain coverage no other camera crew can capture. 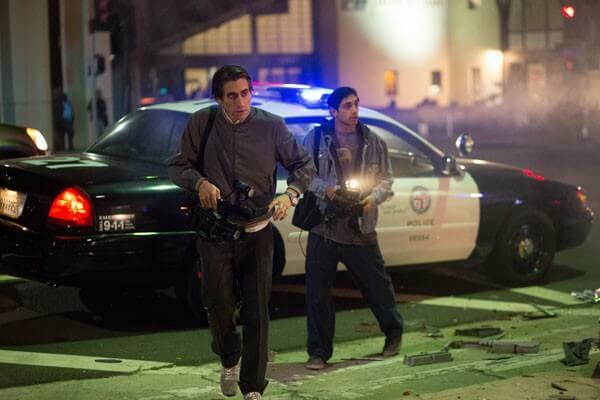 Riveting and deeply disturbing, Nightcrawler is an intense and extremely dark journey into the madness and sensationalism that is ratings-driven television news. This is an exceptionally compelling film with a mesmerizing performance by Jake Gyllenhaal as Louis Bloom, a completely unethical, immoral, and despicable individual willing to do anything to improve his coverage of local tragedies for the morning news. It’s Gyllenhaal’s best performance of his career. From his wide-eyed stares to his body posture and the precise delivery of Bloom’s dialogue, the movie chronicles the rise of a sociopath to the top of his profession. Rene Russo gives one of her finest performances in years as Nina, the past-her-prime news director who at first sees Louis as a talented up and coming freelancer but quickly realizes he’s the best at getting her the goriest and most intrusive ratings-winning camera coverage of horrific news stories. Nina’s both drawn to and at times repulsed by Bloom, and the scenes between Gyllenhaal and Russo sizzle with energy and sexual tension. The production and direction of the film by Dan Gilroy is slick and flawless, capturing vividly the dark and scary side of L.A. at night. The script is rich with crisp dialogue and the action scenes of police chases and shoot-outs are thrilling. Captivating and unsettling, Nightcrawler is an intense thriller that will have audience both fascinated and horrified by Bloom’s actions and will hopefully garner Gyllenhaal an Oscar nomination for a truly unforgettable performance.